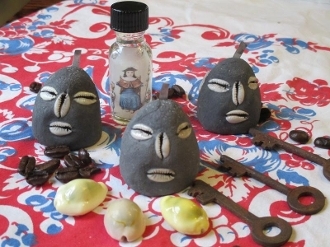 These are 2 inch Eleggua heads created from cement with the traditioal cowrie eyes, nose and mouth. Each head has a small space in the bottom which can be filled with curios, herbs or any offering the sealed over with wax. Just peel away the wax and refill to place a new offering or request inside! Each head comes with my own Nino de Atocha Sacred Image oil, Eleggua's Saint aspect. Place your Eleggua behind your front door to bring luck and open roads to your household! *These heads are effigies only-they were not created by a Santero, they have not been fed or activated.